Trainer Trevor Andrews is hoping Luckygray’s successful return from injury will spark a run of feature wins at Belmont Park for his stable. 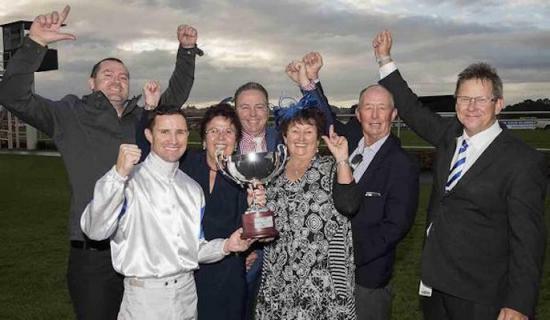 Sidelined from racing for 12 months because of a leg injury, Luckygray claimed his second Roma Cup (1200m) when he edged Dawn Approach and Fuchsia Bandana in a tight finish on Saturday. Andrews said yesterday Luckygray pulled up well from the win and would improve heading into the $150,000 Belmont Sprint (1400m) and $150,000 Hyperion Stakes (1600m) on May 30 and June 13. The triple Group 1 winner claimed the Roma Cup, Belmont Sprint and Hyperion Stakes in succession for trainer Gino Poletti in 2012. “He licked his bin out and he’s very bright,” Andrews said. “He’s going to improve fitness-wise out of sight. He only just fell in, but he hasn’t raced for a long time and the second horse was race fit. With more than $2.67 million in prize money, Luckygray is approaching Scenic Shot’s record as the second-highest earner in WA racing. Scenic Shot won just over $3 million. Northerly holds the record with $9.34 million. Andrews is also eyeing the Listed $100,000 WAROA Belmont Guineas (1600m) on June 20 with Outlaw Pete. The talented three-year-old will resume in a 1400m handicap at Belmont on Saturday. “I’ve been chasing my tail getting him ready, but he’ll be spot-on for the Belmont Guineas,” Andrews said. “Paul Harvey will most likely ride him in the Guineas if he’s going well. Outlaw Pete warmed up for his return with a solid trial win at Belmont a week ago. Andrews is also considering a short preparation for his brilliant juvenile Lucky Street, who won the Karrakatta Plate (1200m) in March.